Dr. Jordan Rixen, specializes in cataract, corneal transplant and laser vision correction surgery. He graduated from Iowa State University and received his medical degree from the University of Iowa Carver College of Medicine. He completed an internship at Gundersen Lutheran Medical Center in La Crosse, Wisconsin followed by a residency in Ophthalmology at the University of Iowa Hospitals and Clinics. After residency, he remained at the University of Iowa Hospitals and Clinics to complete a fellowship in Cornea, External Disease and Refractive Surgery. Dr. Rixen has clinics and performs surgery in Lincoln, Crete, Syracuse, Tecumseh and Nebraska City, Nebraska. 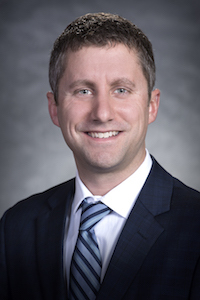 Dr. Rixen is board certified and a member of the American Academy of Ophthalmology, the American Society of Cataract and Refractive Surgery, the Lancaster County Medical Society and the Iowa Eye Association. Dr. Rixen has seven professional appointments: Lincoln Surgical Hospital, Bryan Hospitals, CHI Health St. Elizabeth and Nebraska Surgery Center, all located in Lincoln, Crete Municipal Hospital in Crete, Johnson County Hospital in Tecumseh, Community Memorial Hospital in Syracuse, and St. Mary’s Community Hospital in Nebraska City, Nebraska. He and his wife, Erin, have two sons and a daughter. He is an avid sports fan and enjoys running, traveling and spending time with his family.